Abstract: Verbs of perception have been typically classified into three semantic groups. Gisborne (2010) calls the three categories agentive (listen class), experiencer (hear class), and percept (sound class). Examples pertaining to the sense of smell in English use the same lexical item (smell), while in Polish, the three senses of smell are expressed with different verbs: wąchać (agentive), czuć zapach (experiencer), and pachnieć (percept). In metaphorical extensions of the verbs of sensory perception these verbs often stand for mental states, as meaning shifts typically involve the transfer from concrete to abstract domains. I show that the metaphorical extensions of pachnieć and percept to smell are quite different. Not only does pachnieć not suggest bad character or dislike- able characteristics, it actually conveys the opposite, as in the expression coś komuś pachnie ‘something is attractive to someone’ or when used without a modifier. These differences stem from the positive meaning of pachnieć and the negative meaning of to smell. Since the percept verbs of smell seem to be intrinsically positively or negatively valued, they do not lend themselves to universal Mind-as-Body extensions. I also consider some of the dramatic frequency contrasts between Polish and English smell constructions and show they can have their root in different cultural scripts underlying modes of speaking (pachnieć jak vs. smell like), framing of experiences (czuć zapach vs. experiencer to smell), polysemy, and different constructional capabilities (wąchać vs. to sniff ). Abstract: In the recent literature on gradable predicates, it has been argued that the notion of a differential degree (one that measures the distance between two values on a scale) plays a role in the semantics of both adjectival and verbal predicates. This paper provides further evidence in favor of this claim by putting forward a unified account of the prefix po- that attaches to Russian comparative adjectives/adverbs and the attenuative po- that combines with verbs. Building on Filip’s (2000) and Součková’s (2004a, b) analysis of the verbal po-, it is argued that po- is a single prefix whose function is to restrict the differential degree and which applies within the verbal, adjectival, and adverbial domains. In addition, this paper investigates the interaction of this prefix with verbs lexicalizing scales of different dimensions. 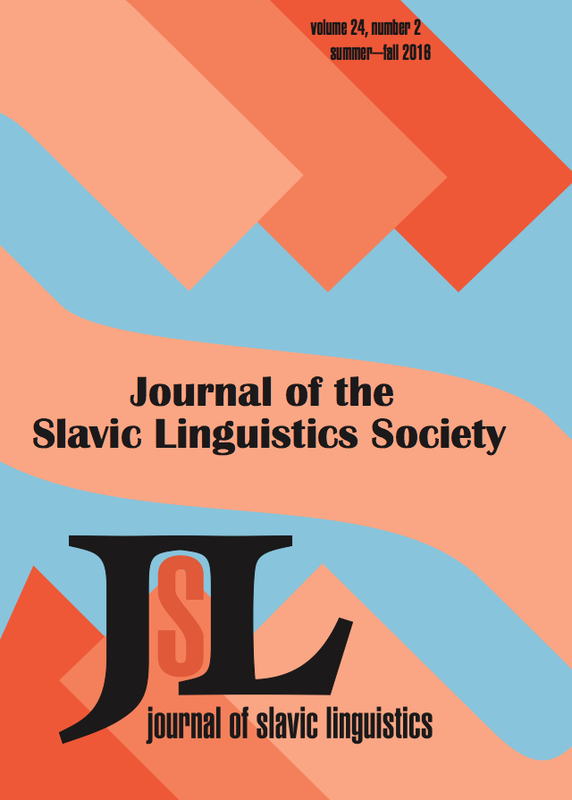 Abstract: This paper presents experimental data on the processing of loanwords and nonce words that focuses on morphophonological alternations in Russian. It addresses the issue of how stem allomorphy involving palatalization of the velar/palatal and dental/palatal types in the Russian verb system is processed in adults. The processing of morphophonological alternations is shown to be quite variable (and probably un- productive) and to depend, on the one hand, on the distribution of allomorphs within the verb paradigm, and on the other hand, on verb class productivity. It is hypothe- sized that these differences should be reflected in child language acquisition. Abstract: This article explores the fall and vocalization of the jers, making five claims. First, it is shown how the jer shift can be analyzed in terms of a trochaic pattern, whereby a jer fell unless it headed a foot. Second, the foot-based approach is argued to be superior to the traditional counting mechanism postulated for the jer shift in that the foot-based approach avoids ad hoc stipulations and facilitates crosslinguistic comparison. Third, the present study relates the fall of the jers to a trochee-iamb shift in Russian prosody; a few generations after the jer shift was completed, an iambic pat- tern was introduced through the emergence of akan’e. Fourth, it is proposed that Con- temporary Standard Russian may be a “switch language,” i.e., a language in which productive processes are sensitive to both trochees and iambs. Last but not least, the present study analyzes prosodic change from the point of view of cognitive linguis- tics (the Usage-Based Model) and shows that this framework offers a straightforward account of the jer shift.